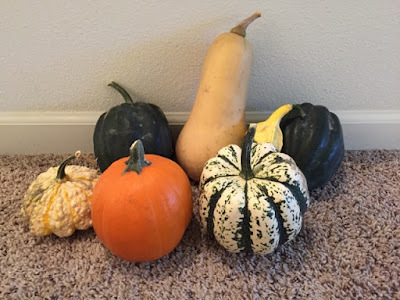 Now that fall is officially here, I'm officially in squash season. Honestly, growing I don't ever remember having squash, but now that I have my own kitchen, its been on the menu for the past few weeks. Here are some ways I'm using it. I tend to be gone for 10+ hours a day so I've started using my crockpot overnight to make sure that I'm not overcooking dishes. One thing I've done so far is to put a butternut squash in for 8 hours on low overnight to make an easy mash or puree. You literally put the entire thing in, without halfing or dicing, and then after its done, cut it open and take out the seeds and pulp. I did this last week and put the flesh in my mixer with some butter, salt, pepper and cinnamon and ate it as a mash a few times throughout the week. Delish and super easy. Just like pumpkin seeds, you can roast the seeds from your squash. The basic is a favorite, but I'm also loving this recipe for curried squash seeds. I love throwing vegetables together on a baking sheet and roasting them for easy and delicious sides. You can do that with all types of squash. Here's a great tutorial from The Kitchn on peeling and cutting squash if you're new. Squash can last on your counter for 4-6+ weeks so I bought a bunch and have them on my counter with some gourds and pumpkin. They provide colorful and whimsical decoration before using them in future dishes. Squash can provide a great backbone to your main dish. I've tried this Moroccan Lamb Tangine with squash and I'm looking forward to trying this acorn squash with kale and sausage.